The case originally came with those cherries that were attached with a key ring. The key ring eventually broke, and the cherries fell off, so I ultimately was stuck with a case that had an ugly, cheap-looking metal loop on it and nothing else. But then, I moved apartments and unearthed a keychain I was given with a nail polish purchase. Yeah, random. 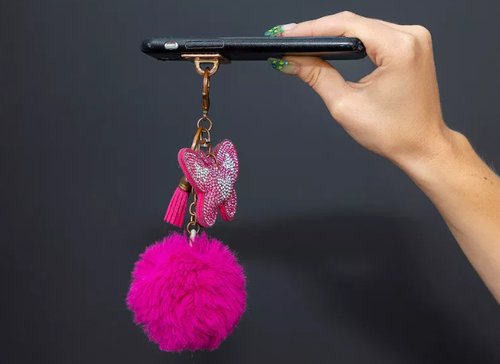 It features a bright pink pom-pom with a pink tassel and a bedazzled butterfly. 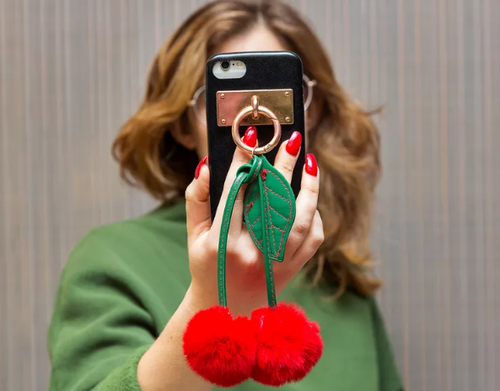 I tried hooking it onto the phone, and sure enough, it filled the cherry pom-pom void in my heart. After a month or so in my bag, though, the pink started to turn black with dirt. That wasn’t my favorite look. Now, having just moved, I was in my local dollar store and saw a strange keychain made out of a bike chain. I think it might be designed for attaching to a wallet and then hanging from your belt loop? I’ll probably try that at some point, but for now, I bought it solely for my phone. It looks extremely industrial. I love it. 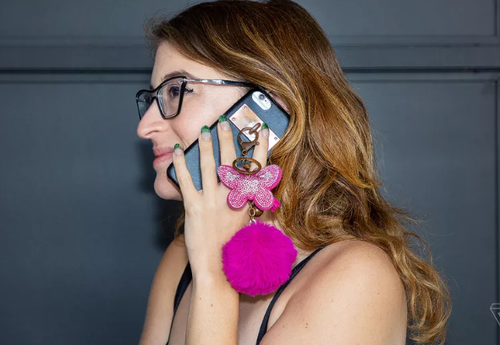 I wear the loop around my wrist or carry it like a purse. Either way, it feels more like a fashion statement than my other cases. I only wish the metal loop on the back of the case was silver so it matched. I love this case because I can change it up without fully committing to a whole new design. 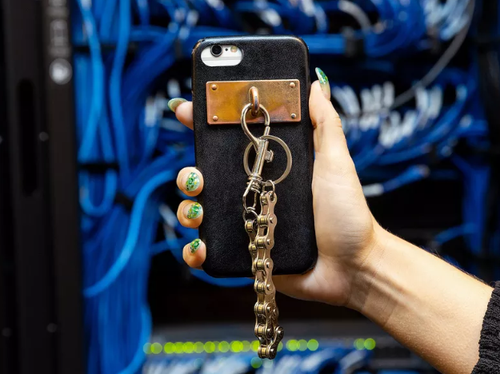 A keychain makes my case feel new, and this time around, I’m fully leaning into the hardware trend. Cherries felt good at one time, when spring was just happening and summer was on its way. Now, it’s been over 90 degrees for what feels like years, and all I can think about is fall. I needed this bike chain in my life. I don’t know when I’ll change this case out. It’s definitely falling apart a little bit; the sides are peeling up and even the “leather” is peeling, too. If I do end up with a new case, I’ll post about it, but for now, know that my cases and I are in a good place. We’re happy.